I am running one day practical coppicing courses and two day coppicing courses in November, January, February and March. 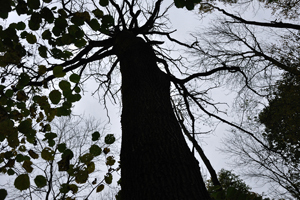 UkWAS (UK Woodland Assurance Standard) states that “Management practices should be contributing to the accumulation of standing and fallen deadwood, in equal proportions, to a minimum of 20 m3/ha”. In areas of high ecological value, greater volumes would be required. 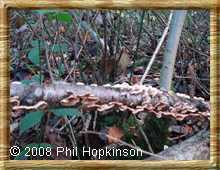 In order to provide deadwood habitat throughout the woodland, in most hectares there should be a few dead standing and fallen stems contributing to the overall deadwood provision. One of the woodlands I manage is a nature reserve. It was clear-felled in 1929 and although some compartments have been coppiced and standards of various ages left, it is a relatively even aged woodland with very little standing deadwood. 7 years ago I ring barked three trees In this woodland. One was an Oak (Pictured below) another Ash and the other Birch. The Birch rotted very quickly and produced some amazing bracket fungus. Within a few years the Ash only had the trunk and a few larger branches left. There was very little fungi. The Oak had leaves appearing on it for the two years following the ring barking.7 years on the vast majority of branches are still intact with some small twigs still present. There is evidence of some smaller branches being brought down in high winds. However the most impressive sight is the fungi that has travelled up the length of the trunk. Splits are starting to appear in the bark around the site of the ring-barking there is a mass of small animal life. I used a chainsaw to ring bark the trees. Cutting two cuts right round the tree making sure they went through the bark and cambium layer. The bottom slot was about 30cm above ground level. The 2nd slot was about 10cm above this. I then went round the whole circumference of the tree and removed all the bark between the two cuts. The reason for this was to make the tree clearly visible. 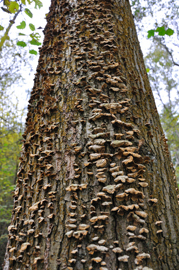 It is suggested that Oak are good trees to ring bark as their deadwood has greatest habitat value as it supports the greatest number of species. Birch also has good habitat value but it is not a long lasting. Ash on the other hand supports far less life. UKWAS recommends stems greater than 20cm diameter. It has been recommended to ring bark groups of trees in relative proximately as the creatures relying on this type of habitat are small and so may not easily travel larger distances. Mitigate the risks to public health and safety by carrying out any ring-barking well away from any paths, rides or roads or any areas with public access and well away from any wayleaves. I feel that there are many woodlands that are too small to qualify for Forestry Commission grants but that would benefit from more standing deadwood as they are relatively young woodlands or have been clearfelled in the relatively recent past. Take time to get to know your woodland before making decisions about changes. Never rush into decisions that will affect the woodland and it's wildlife for generations. These pictures have been taken by Elaine Hodgson in woodlands that I have worked.